Arthritis is the term for conditions which cause inflammation of the joints. There are more than 100 different forms of arthritis, with a broad range of causes. Some of these forms of arthritis have close associations with certain types of diabetes. Arthritis can usually be treated to help reduce symptoms and slow progression of the condition. Arthritis is common, with an estimated 10 million people living with the condition in the UK alone. Osteoarthritis is the most common form of arthritis, affecting around 8 million in the UK. Whilst arthritis is most commonly associated with the elderly, a number of forms or arthritis can affect people of any age, including children. Certain forms of arthritis may be more common in people with certain types of diabetes. People with type 2 diabetes have higher risks of developing osteoarthritis and gout, which is likely on account of the fact that obesity increases the risk of type 2 diabetes as well as these forms of arthritis. People with type 1 diabetes have significantly higher risks of also having rheumatoid arthritis. Both conditions are autoimmune diseases and research suggests that certain genes may increase the risk of both conditions. The common symptoms of arthritis are inflamed, swollen joints, which may be painful and may lead to limited movement of the affected joint. Other symptoms may also occur and these will vary depending on the type of arthritis. The causes vary considerably by type of arthritis. Similarly, treatment for arthritis can also vary considerably too depending on the type. 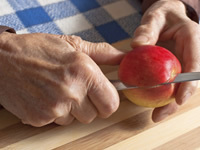 There are some treatments, however, that will be commonly applied to a number of forms of arthritis, such as painkillers and corticosteroids to reduce inflammation. For some types of arthritis, specialist drugs can be taken to slow the development of the condition. Surgery is a less common treatment but may be needed to treat particular problems that can’t otherwise be treated. Osteoarthritis is the most common form of arthritis. It is caused by damage to the joints which can be brought on by a number of factors including joint injury, other forms of arthritis and excess pressure on the joints caused by obesity. Whilst osteoarthritis is more common in the elderly, younger people can also develop the condition. This form of arthritis most commonly affects the knees, hips and the joints in the hands, making these joints stiff and painful. Life with osteoarthritis can be made easier through taking exercise and, if overweight, reducing the strain on your joints. For this reason, water exercises (aquatic exercises) and swimming are particularly good for people that have osteoarthritis in their knees or hips. Painkillers and corticosteroids may be prescribed to treat painful symptoms or inflammation. Rheumatoid arthritis is an autoimmune disease that affects around 400,000 people in the UK. The condition results in the body’s immune system mistakenly attacking and destroying the lining of joints. The condition causes joints, particularly the joints of the hands, wrists and feet, to be swollen, painful and difficult to move. Other symptoms, such as fatigue, anaemia and flu-like symptoms can also result from the condition. The symptoms of rheumatoid arthritis may flare up and become worse for periods of time before settling again. People with rheumatoid arthritis will usually take more than one type of medication, which include painkillers, anti-inflammatory drugs, steroids and disease-modifying anti-rheumatic drugs (DMARDs). DMARDs are taken specifically to prevent the immune system from damaging the joints. Gout is caused by high levels of uric acid which can result in formation of crystals in and around the joint that can then lead to red, swollen and painful joints. Symptoms of gout may come and go. Some people have regular episodes of gout whereas other people may experience episodes separated by years. Lifestyle changes, such as those recommended for people with type 2 diabetes, can help to prevent future episodes of gout. Should an attack of gout occur, anti-inflammatory drugs are usually effective in relieving the symptoms.